Skyrim is a pretty big place, and to successfully explore its icy reaches, you're going to need a map. Admittedly, yes, the game does in fact come with a map, one you can access at the touch of a button, but what if it isn't detailed enough? Well, then you go and type "Skyrim map" into Google. Or you could buy the official Skyrim Map app for iOS. Made by strategy guide publisher, Prima games, the app charts the entire province of Skyrim, with each of the nine largest cities marked for free. Assuming you want directions to something a little more esoteric than "that giant, horizon-filling metropolis that's already marked on your in-game map" you'll have to spend a little money. 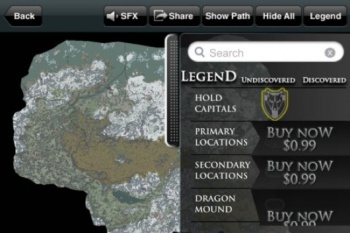 It costs $0.99 cents to unlock sets of locations, such as the dragon mounds you can see in the screenshot there. The map comes with over 160 interior maps, a search function and the ability to zoom in as far as 3200%, so you can pretend to be a tiny meteor hurtling towards Belethor's shop. The app is only available in the US. I know, I'm disappointed too.